Farmer Tone, a local “farmer without a farm” here in Palm Beach County attended July 30th Board of County Commissioners (BCC) meeting as an advocate for the policies of the United Nations Year of the Soil. Farmer Tony promotes the awareness of basic sustainability initiatives to promote polices for safe soil. He aims to educate about the necessity to protect valuable soil resources, preserving them for uses other then residential and commercial development. The quality of our soil plays a valuable role in issues that affect us all including food security, climate change, protection of the ecosystem, alleviation of poverty, sustainable development, clean water and the basic health of all plant, animal and human health on the planet. Part of Tony’s presentation at the workshop is to educate decision makers on drafting policies that preserves, protects and improves soil’s role as a food resource and to advocate for land use for agrarian purposes and allocation of incubators in ag-reserve to urban farmers by the county from the 100M piece of land purchased by taxpayers. 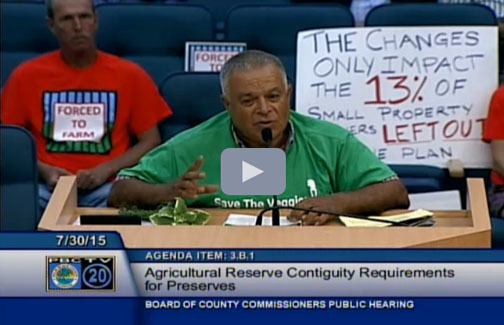 Click the link and go to 1:39 to see Farmer Tone speaking in front of the Palm Beach County Board of County Commissioners. Click the link and go to 3:55 to see Farmer Tone speaking in front of the Palm Beach County Board of County Commissioners.